The mum of a teenager who drowned swimming in a quarry has delivered an emotional presentation to college students on the horror of losing her son. Beckie Ramsay has visited Doncaster College to talk to youngsters aged 16 – 25 about her son Dylan who died in 2011 at a quarry in Whittle-le-Woods, in Chorley, Lancashire, aged just 13. Dylan was swimming in a quarry and had been in the water about twenty minutes before getting into difficulties. He was pulled from the water and given CPR but was unable to be resuscitated. Ever since, Beckie has worked tirelessly to promote water safety and has launched a campaign in his memory ‘Doing it for Dylan’. Doing it for Dylan was set up to get water safety messages to children, students and adults to raise the awareness around the dangers of swimming in open water. South Yorkshire Fire & Rescue (SYFR) is now planning to take water safety into schools this summer to teach youngsters about the unseen dangers in water. SYFR Community Safety Officer Gary Willoughby said; “We regularly receive 999 calls in the summer about people getting into difficulty in water. It can be tempting to cool off in the summer months, but stick to a swimming pool. 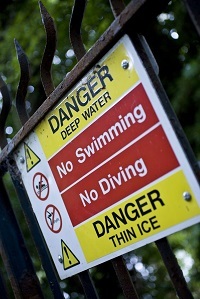 Hundreds of people drown each year in the UK and places like rivers, lakes or flooded quarries are completely unsuitable for swimming as they hide a number of hidden dangers. Remember NO lifeguard means NO swimming”. Over 400 people die in the water every year in the UK, and firefighters are urging people to follow some basic rules to stay safe.